This week's tech rant isn't about Nokia, hoverboards, or the iPad mini 3. Nor is it about Apple Pay double-charging some customers, or Google trying to reinvent the email. This week it's about Hollywood. Because this week we learned that we'll soon be treated to another retelling of the well-told Steve Jobs story, with producers revealing that former Batman Christian Bale is going to be gaining and losing weight and facial hair to tell us everything Wikipedia already tells us about the founding of Apple. And it'll be the most pointless of all film genes - the biopic. As in, a story we already know, about a famous person we already know practically everything about, and one that's already sadly died so the ending won't be much of a shock either. 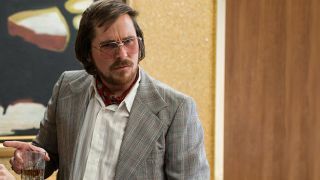 Christian Bale will need a bit of smoothing out to play young Steve when he was churning out circuit boards in his garage, then there's the shift to paunchy middle-aged Steve from the late 90s and early 2000s, before skinny, balding Steve emerges during Apple's later, second wind, i-powered glory years. If nothing else, this latest Jobs canonisation attempt should get some awards in the hair and makeup categories, and let Bale demonstrate the full range of his beard. And if you're lucky, any subtle edits you make to his Wikipedia entry in the next few weeks may make it into the final film, as its producers scrabble together the many public domain stats about the Apple legend. It'll be two-hours of retold anecdotes, mostly taken from a book that's already three years old, in which Jobs will be portrayed as the often frustrated genius we already know pretty much everything about. We may even see him invent some products we also know about and frequently use. The dialogue will either be made up or based on things we already know were said. The inevitable sequence in which Jobs and Steve Wozniak, the Robin to his Batman, have the idea of making a Mac in his garage is something we all know happened. We don't need to see it portrayed on film. Details of the invention of the i-devices will show us meetings in which the filmmakers either guess what was said or recreate things we already know we're said - both equally futile. The chances of seeing anything new in the film, or learning anything from it, or of there being any thrilling revelations, are virtually zero. Which, ironically, make it the perfect modern, entirely unchallenging, Hollywood product. Five stars. Ideal Tinder date material. Make sure you see it in 3D - the flyby of the Foxconn factory as the first iPhone cases come out of the production moulds is stunning.